Home // Blog // How does the Broadway version of CHARLIE AND THE CHOCOLATE FACTORY compare to London? How does the Broadway version of CHARLIE AND THE CHOCOLATE FACTORY compare to London? 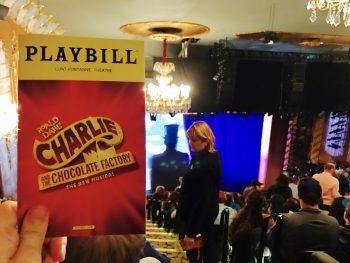 I’ve just returned from New York where I decided to extend my stay by three days so that I could catch the first preview of Charlie and the Chocolate Factory. I had heard stories about how much it had been changed from the London production and so, although I wasn’t massively keen on the original production, I was more than curious to see the new Broadway version. The original West End production focuses on Charlie and his father but for Broadway this has been changed and it is now about the relationship between Charlie and the Candy Man. In fact, Charlie’s father doesn’t even make an appearance in the new show and it is hinted at that he passed away. Gone is the big television set where the golden ticket winners were introduced and instead these scenes are just performed on the regular stage which, whilst not as exciting to watch, actually works much better. The bedroom scenes are executed much better than the two halves of set that used to come together in the London production which always looked a bit clunky. I’d say around half of the songs from the London production have been cut or rewritten for this new show. The songs Candy Man and I’ve Got A Golden Ticket, which were in the original 1971 film have been added to the previous only song from the original film Pure Imagination. These songs are layered and partially repeated throughout the show to give a consistent feel to the production. The great glass elevator at the climax of the show always make me a little uneasy in London, watching Charlie and Mr Wonka shake around on a very unstable looking crane arm to give the effect of flying through the air. Thankfully this has now been replaced and the elevator sits at the back of the stage and just raises up and down during the finale. The original London production felt quite close to the 2005 remake of the film which was a bit cheesy and over the top. The new Broadway version scales this back and focuses on telling the story more clearly. Charlie and the Chocolate Factory still isn’t a five star show but it’s a lot better than the original London production and it is great to see the work that has been done to improve it. As I only saw the first preview, the show may still change before the official opening night but it was a very smooth first performance and I’m really glad I hung around in New York to check it out!